Contact Valley Ford Cheese & Creamery Today! 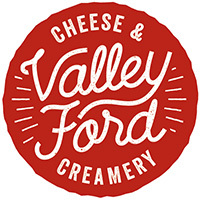 Valley Ford Cheese & Creamery is a farmstead dairy product manufacturing company, located on the beautiful coastline in Sonoma County. The Bianchi family purchased the dairy farm and started milking Jersey cows in 1918, and is now in the hands of the third, fourth, and fifth generations. Pietro Bianchi and his wife Maria immigrated to America from Northern Italy in the early 20th century and purchased the ranch in 1918. In the late 1940s, the farm was handed down to their son John Bianchi and his wife Helen, who ran the operation until the late 1970s, when their son Paul purchased the business from his parents. Today, the farm is still operated by Paul along with his son Steve and daughter Karen. In 2010, upon graduation from Cal Poly, Karen's son Joe decided to come home and join the family operation as the first member of the fifth generation. The dairy is certified humane and treats the land and animals in the most sustainable and natural ways possible. Joe is a California Polytechnic State University graduate with a major in Dairy Science, emphasis in Dairy Products Technology, and a minor in Agricultural Business. Throughout Joe's time at school, he worked at the Cal Poly Creamery, gaining hands-on experience in the production of cheese, ice cream, yogurt, butter, egg nog, and fluid milk. 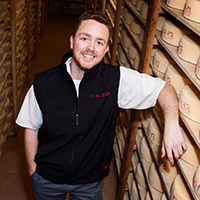 He spent three of his summers completing internships with different cheese companies: Point Reyes Farmstead Cheese Company, Spring Hill Cheese Company, and Leprino Foods in Grand Rapids, Michigan. Upon graduation in December of 2010, he decided to turn down offers to join the corporate dairy world in order to come home and join the up-and-coming family business. Highway One is Valley Ford's version of an old-style Fontina. Its texture is silky and creamy, with the traditional Fontina flavor that pairs great with Italian wines and cuisine. This unpasteurized cheese has been aged for at least 80 days. It is mildly fruity, with a nutty flavor and aroma. It is a perfect anytime cheese and great for melting as well as on a sandwich or on an appetizer plate with crackers. This is the same cheese as the Estero Gold, except it is aged for a minimum of 18 months. As it ages, it develops a stronger flavor, a harder and dryer texture, and becomes similar to a parmesan-style cheese. If you enjoy extra-aged cheeses with those little granular "crunchies" known as crystals, you will love this cheese. The "crunchies" are formed from the amino acid tyrosine, which are common in high-protein, extra-aged cheeses. The "Reserve" is a great cheese for grating and also pairs amazingly well with a glass of red wine. Estero gold is handmade in the style of an Asiago, reminiscent of a Montasio, two of the famous cheeses from the Swiss-Italian dairy country. Our young cheese, aged about 6 months, is very pliable, with grassy, fruity overtones. As it continues to age, the flavor deepens, becoming complex and nutty. It has an open texture with small holes and straw-like coloring. Its subtle, creamy, and buttery taste nicely complements other foods. Its fine rustic flavor can be paired with any wine. It also melts wonderfully in pastas and polenta and shreds beautifully for salads.